"Teach us how to pray," the disciples said to Jesus. 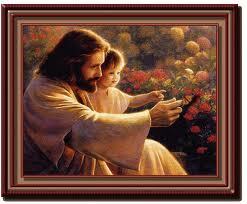 (Luke 11, 1) He answered by teaching them the prayer we call the Our Father or The Lord's Prayer. God and MosesWhen Moses approached God on Mount Sinai, he heard a voice saying, "Do not come near; put off your shoes from your feet, for the place on which you are standing is holy ground." An infinite chasm separates us from the transcendent God.